Daring Greatly. Do you dare greatly? Do you dare at all? 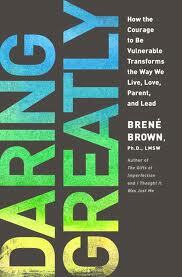 This book by Brene Brown encourages us to take action in our own lives by first understanding ourselves and our motivations. It's a look inward to affect outward action, and it's important work. This book came at a great time for me. Brene is a shame and vulnerability researcher. Scary business. Something I'd like nothing better than to scoff at. Because she makes sense. And I like her. I'm not going to blather on about her book. I'm going to let her speak for herself. If any of this strikes a cord, I suggest grabbing her book. It's really been a great read for me. "When I look at narcissism through the vulnerability lens, I see the shame-based fear of being ordinary." "We're afraid that our truth isn't enough--that what we have to offer isn't enough without the bells and whistles, without editing, and impressing." "Vulnerability is about sharing our feelings and our experiences with people who have earned the right to hear them." "You know that you are far more than a painting, an innovative idea, an effective pitch, a good sermon, or a high Amazon.com ranking. Yes, it will be disappointing and difficult if your friends or colleagues don't share your enthusiasm, or if things don't go well, but this effort is about what you do, not who you are." "We are hard on others because we are hard on ourselves." "We are a culture of people who have bought into the idea that if we stay busy enough, the truth of our lives will not catch up with us." "Much of the beauty of light owes its existence to the dark." "Using vulnerability is not the same as being vulnerable. It is the opposite." "Cruelty is cheap, easy, and chickenshit." "Don't try to win over the haters; you are not a jackass whisperer." "Fitting in is one of the greatest barriers to belonging." "Hope is a combination of setting goals, having the tenacity and perseverance to pursue them, and believing in our own abilities. Hope is plan B." "Daring greatly is not about winning or losing. It's about courage." Reading this book really helped me put a lot of my own life into perspective, and not just my present and future in terms of parenting, but also my past in terms of who I am as a person and why I've gone the path I've chosen. I wholly recommend it. Want to hear more? Take part in the discussion over at BlogHer. This review is paid for by BlogHer, but it is my own opinion expressed, good or bad.